An ECG (electrocardiogram) is a recording of heartbeats. It is the most common test performed to help a Doctor decide on or in many cases eliminate a possible heart problem. It is a simple test that causes no pain and has no side effects. If your Doctor thinks you may have heart disease or a heart related problem, they may refer you to a hospital for an ECG. Some GPâ€™s do this test in their surgery. What is a 24hr ECG/Holter? What can a 24hr ECG recording show? How is it done? Can I continue with normal activities whilst wearing the ECG recorder? What are the benefits of having the test? Are there any risks involved? What happens next? What is a 24hr ECG/Holter? A 24hr ECG is a way of continuously recording your heart rhythm and the heartâ€™s electrical activity over a period of 24hrs. The test can help to diagnose various symptoms that do not happen very often or have not previously been picked up by an ECG. What can a 24hr ECG recording show? The heart produces tiny electrical impulses which cause the heart muscle to contract. 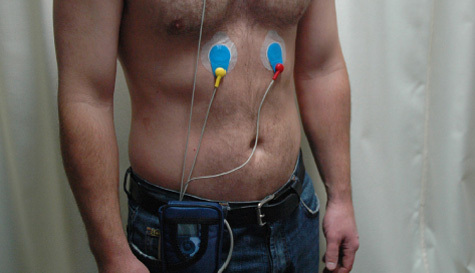 These impulses can be detected and recorded by an ECG. This test may be recommended to help diagnose symptoms such as infrequent palpitations. Electrodes (sticky pads) are placed on your chest and attached by wires to a small recorder which you wear on a belt around your waist. You must avoid applying any body moisturiser/lotion on the day of the test as the pads will not connect to your skin and may give an inaccurate reading. You will be asked to undress to the waist so that we have access to your chest. If you have a very hairy chest we may need to shave a couple of small patches for the electrodes to stick. The recorder will continuously record your heart rhythm for the 24hr period. You will not feel anything different as this happens. You will be asked to keep a diary while wearing the ECG recorder and make a note of the time you have any symptoms. You will be instructed to press a little button on the box if you have symptoms but the heart rhythm is recorded continuously. You can then leave the clinic and continue all your normal activities for the next 24hrs at home. However, you cannot bathe or shower whilst wearing the monitor. You will be shown how to remove your monitor at the end of the 24hr period, place it in the wallet provided and return it to the Heart Test clinic. Can I continue with normal activities whilst wearing the ECG recorder? You will be asked to keep to your normal routine and do any activity that would normally bring on your symptoms. You must avoid having a bath or a shower as you must not get the recorder wet. What are the benefits of having the test? The 24hr heart recording is taken to see what your heart rhythm does when you are undertaking normal daily activities. Resting ECGâ€™s are very short and any heart problems may not manifest themselves during this time. Therefore 24hr recordings are of more use and give your GP further information in the assessment of your heart rhythm (fast or slow), to check if your medication is working correctly and to record any dizzy spells you may have experienced. There are no known risks involved with having an ECG. Occasionally some people have a mild reaction to the sticky patches placed on their skin. You should inform the staff if you are allergic to elastoplast. You will need to return the monitor to the Heart Test clinic the following day with your diary. The data is then analysed and reported upon by a Consultant Cardiologist and the results forwarded to your GP who will interpret them and give you the formal result.